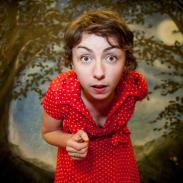 This is Irish storyteller Clare Muireann Murphy. Here is a 3 min You Tube clip in which Clare tells the best version of this particular tale I have come across. Enjoy!